“I am simply aghast by your questionable instructions issued directly to the Pr. Secretary (Services) to post an officer of your choice as the acting Chief Secretary of Delhi. You have bypassed the democratically elected government. I would strongly request and urge you to remain within the confines of the Constitution and the laws relating to government of NCT of Delhi. Najeeb Jung had yesterday appointed Gamlin to the post despite strong opposition to her nomination by Kejriwal dispensation which alleged that she had close links with BSES discoms. The 1984-batch officer has, however, denied the charges saying they were baseless. The AAP government also attacked the BJP accusing it of attempting to stage a coup through the LG. Do note: “perceived to be” !! Deputy Chief Minister Manish Sisodia, who also holds the charge of Services department, targeted BJP over the issue. “The BJP through LG of Delhi has attempted a coup against the democratically elected government of Delhi with highest ever mandate in the history of the state. 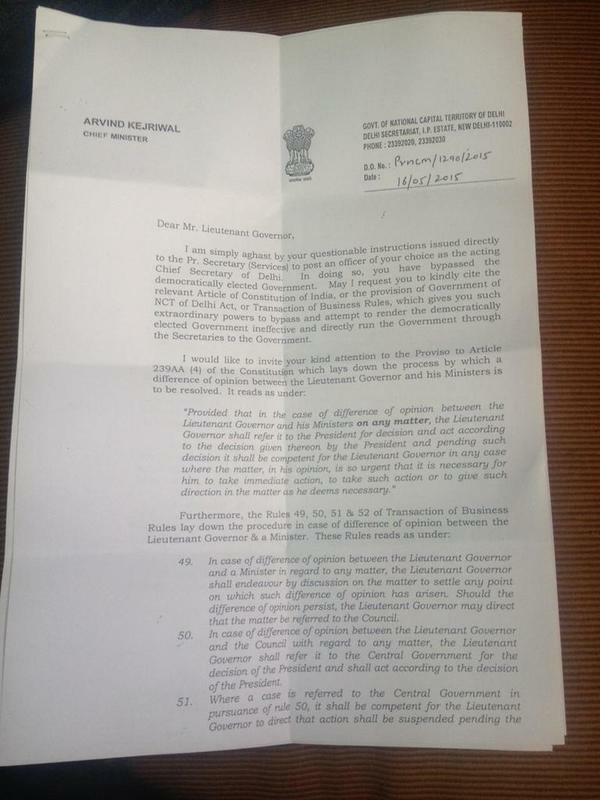 Meanwhile, Parimal Rai, who was backed by Kejriwal for the post, declined to become acting Chief Secretary, noting that he respects the Lt Governor’s directions. The constitution’s position on this is very clear. Agreed, but the discretionary role of the Lt. Gov is far more than the governor of a state, which brings us back to the point that Delhi is not a state, so comparisons with the federal structure that exists in respect to states and the union is misplaced. Delhi is a union territory. It also clearly and unambiguously mentions in a previous clause that the administrator for the NCT of Delhi would be the Lieutenant Governor. Short title and commencement.- (1) This Act may be called the Constitution (Sixty-ninth Amendment) Act, 1991. (2) It shall come into force on such date as the Central Government may, by notification in the Official Gazette, appoint. Insertion of new articles 239AA and 239AB.- After article 239A of the Constitution, the following articles shall be inserted, namely:- `239AA. Special provisions with respect to Delhi.-(1) As from the date of commencement of THE CONSTITUTION (Sixty-ninth Amendment) Act,1991, the Union territory of Delhi shall be called the National Capital Territory of Delhi (hereafter in this Part referred to as the National Capital Territory) and the administrator thereof appointed under article 239 shall be designated as the Lieutenant Governor. He is not the governor, he is Lt. Governor and the administrator of Delhi, which means head of administration. Provisions given in the constitution for governors do not apply to him as a special article mentioning his roles and responsibilities was introduced by the 69th amendment. Delhi and Pondicherry are two Union Territories that have CMs. In Pondicherry this model has been running quite peacefully. 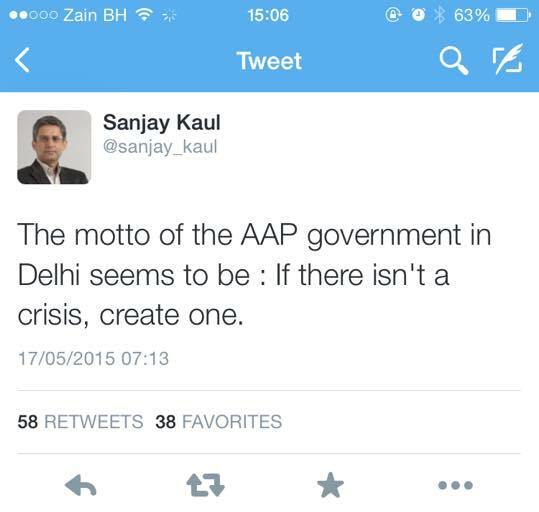 Delhi too had a long and stable relationship with this model, with Congress govt. not ready to voice opinion against a constitutional provision that they themselves had brought. BJP when in power in Delhi had raised the issue of full statehood. 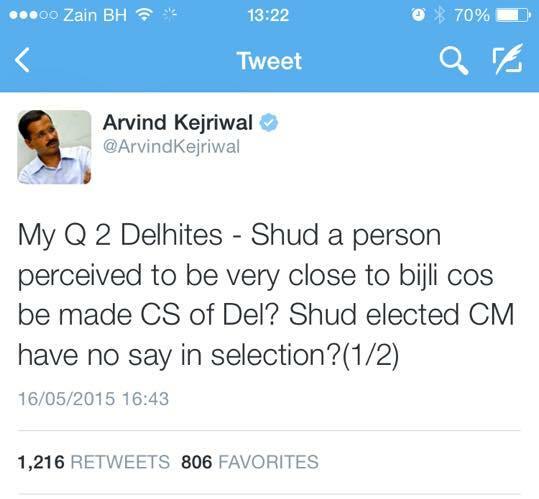 Arvind Kejriwal should demand that too, but not in this crass manner that he has currently chosen to. 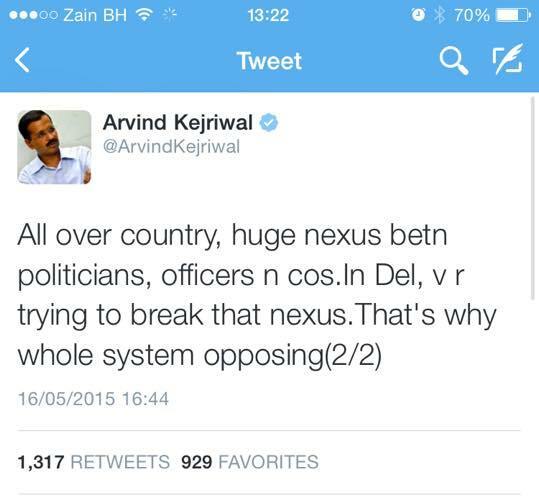 He should properly demand full statehood for Delhi, as he has the mandate for it. Not just the law, even the constitution will have to be amended to grant full statehood to Delhi. But the AAP can’t achieve this by alienating the central government. Only the Parliament can make that law, and AAP’s presence in Parliament is negligible. Arvind Kejriwal should pick his battles carefully and make measured remarks. Squabbling with the LG over staff appointments when administrative appointments are under his discretionary role, should not be made an issue. It just looks ugly. Here is a tweet which tells all in few words. The AAP government would be well advised to control its enthusiasm and go about things in a measured, dignified manner. If Kejriwal wants all powers of a chief minister, then he better start conducting himself like a chief minister ought to, and not come across as a clown.